We’d love your help. Let us know what’s wrong with this preview of King Rat by James Clavell. To ask other readers questions about King Rat, please sign up. i want to read asian saga series,should i read in chronological order or by publication? ?are the books even related?? Changi was set like a pearl on the eastern tip of Singapore Island, iridescent under the bowl of tropical skies. It stood on a slight rise and around it was a belt of green, and farther off the green gave way to the blue-green seas and the seas to infinity of horizon. This beautiful opening line is like a promise of fantastic adventure, exotic trip, it evokes some delightful place, a mystery island you always dreamt about but it is anything but it. Changi was the inhuman Japanese camp for the war prisoners, for people whom the only sin was that they lost their war and didn't die. I had read some camp stories already but mostly European, and though my knowledge of the war on the Pacific is only basic this one felt very reliable to me. Not only because it is based on facts from Clavell’s life who himself was a prisoner of Changi camp in Singapore and thanks to it the whole story, being still the work of fiction, gained air of realism and credibility; not only because it is a gripping, well paced reading, also because it reads as an excellent study of characters and morality in extreme situations. And is pretty damn well written. The two main characters of the novel are the men representing totally different approach to life: pragmatic and smart, self-made American named the King and Peter Marlowe, somewhat uptight English guy, well-educated and brought up in the family with military traditions. Both in readers and other prisoners the King arouses mixed feelings. Disgust, sympathy, antipathy, open hostility and then again admiration. For his cleverness, business sense and good fortune he’s the object of jealousy and hatred but the King is not a thief. He just has a flair for organizing his life easier and seize any opportunity to gain some money and money will give him the rest. The food, medicaments, cigarettes and something less tangible: sense of power. Though set in particular time and place it's a fictional account but I think Clavell did fine work here not only showing animosities between ordinary soldiers and officers, confrontation between the King and other prisoners, especially rivetingly is shown conflict with provost marshall Grey, but also indicating different attitudes and class differences of three main national groups of prisoners: British, Australians and Americans. King Rat is a clash of personalities, a display of cynicism, lack of scruples and ability to adjust to any situation in the camp. But also an extraordinary courage, solidarity and commitment. It's about a price you are willing to pay to survive and principles you could sacrifice to make it. There is no easy explicitness here, no distinct line between that what you can accept and not feel irretrievably corrupted. It teaches you that to outlast the camp, like on the outside in fact, you need to be a part at least a small group, that the camp is not a place for a lone wolf. But it’s also about a fear what life would be alike after Changi since no one escaped the camp unchanged, that place made them, then reshaped and destroyed, and how one can forget about atrocities prisoners were subjected to. King Rat has a whole bunch finely drawn figures but it’s the King and Marlowe that have our interest. I liked the dynamics between them, the way their relationship developed, what they went through and lessons they learnt from themselves. And though I’d like to see them leaving Changi and arm in arm going towards setting sun I somewhat felt the ending, sad as it was, to be more true. Сега знам защо тази книга е толкова популярна, защо е класика. Защото е драматично-иронична песен за войната, мъжеството, приятелството, смъртта и дома. Защото в нея има всичко. Има страх, примирение, безразличие, има надежда и любов. Питър Марлоу се придвижи между Дънкън и корееца и прикри капитана така, че той да поизостане от хората си и да излезе отстрани. Колоната се точеше по пътя, но майката и детето не направиха никакъв знак. Когато Дънкън се изравни с тях, погледите им з Сега знам защо тази книга е толкова популярна, защо е класика. It's not cool to praise James Clavell - and indeed, Shogun is extremely silly. I recall a couple of Japanese people cringing when I once was foolish enough to mention it (I believe they showed the series on Japanese TV). But this book, which is based on Clavell's own experiences as a World War II prisoner of war, is pretty damn good. There's something universal about his description of camp life. He doesn't try and draw any moral, and there are no obvious symbolic associations, but at the end I It's not cool to praise James Clavell - and indeed, Shogun is extremely silly. I recall a couple of Japanese people cringing when I once was foolish enough to mention it (I believe they showed the series on Japanese TV). But this book, which is based on Clavell's own experiences as a World War II prisoner of war, is pretty damn good. There's something universal about his description of camp life. He doesn't try and draw any moral, and there are no obvious symbolic associations, but at the end I found myself wondering what it was that I wasn't thinking about because I was so desperate to get enough food to stay alive. Or how someone who hadn't been subjected to those pressures would view me. It's worth reading! I read this once decades ago, but Mom & I were talking about it one morning. When she got her hair cut later that day, she found a copy in their free book rack & loved it. My library has it in an audio edition, so I listened to it. It's a great fictionalized account of American, British, & Australians in Changi, a Japanese POW camp during WWII. This audio edition has extra material from the original manuscript that's never been published before including an introduction written by Cla I read this once decades ago, but Mom & I were talking about it one morning. When she got her hair cut later that day, she found a copy in their free book rack & loved it. My library has it in an audio edition, so I listened to it. It's a great fictionalized account of American, British, & Australians in Changi, a Japanese POW camp during WWII. This audio edition has extra material from the original manuscript that's never been published before including an introduction written by Clavell's son. Clavell was a prisoner in the Changi POW camp that this book centers around. He wrote this during a screenwriter's strike in 1962, a fictionalized account of his own incarceration there. While he inspired the Phillip Marlowe character (Who also shows up in Noble House.) there really was a character who inspired The King. I'm not sure how much is fact or fiction, but think there's enough fact to put it on my 'sort-of-nonfiction' shelf. The extra material are chapters covering the story of some of the women whose men are in the prison camp. They're a great addition. His mother had written to him weekly. On his release he received the letters. During his incarceration, he neither sent nor received any. His mother wrote all those letters not knowing if he was alive or not. Uncertainty is hell & the Japanese, although they signed the Geneva Convention, never ratified it nor did they follow it. IIRC, when I first read this decades ago, 98% of the American's in the Japanese POW camps died. Those are no longer the figures I'm seeing when I google this now & the Princeton Bio says only 1% of the prisoners at Changi died while Clavell says 90%. Overall, 1/4 - 1/3 of the prisoners died according to most sources. By all accounts, most deaths were due to disease & starvation exacerbated by extremely crowded conditions. Clavell does a superb job describing everything, although it's awful. Clavell, a 6' tall man, weighed 98 lbs when released from Changi, likely a bit more than half what he should have weighed. He writes that death was a mercy to some & many lost their health completely, going blind, losing all their teeth, among other horrors. The end was the most interesting. The entire book is based on how horrible the camp is, yet what happens when the war ends? You need to read it to find out. Wow! The original prison was built to hold 600 prisoners, but the Japanese used it to hold 3000 civilians during WWII. This sort of overcrowding was apparently typical. This was read by Dave Case. He had a lot to live up to since 3 others in this series were read by John Lee who absolutely wowed me. He did a good job. This doesn't follow the book precisely, but was still a great movie. This isn't quite the correct edition. The ISBN doesn't match & the language is English, but the narrator is Dave Case & the publisher is Books On Tape, so close enough. This is the first volume in Clavell's "Asian Saga," and was written about the Japanese prison camp of Changi located in Singapore, where the author himself was held as a POW during the late stages of World War II. "The King" is a successful wheeling and dealing American. Using capitalistic initiative, he concocts many money-making schemes, the most shocking of which, involves breeding rats to sell as "rabbit" meat. He generates feelings of hatred or envy in others, but everyone wants to be close This is the first volume in Clavell's "Asian Saga," and was written about the Japanese prison camp of Changi located in Singapore, where the author himself was held as a POW during the late stages of World War II. "The King" is a successful wheeling and dealing American. Using capitalistic initiative, he concocts many money-making schemes, the most shocking of which, involves breeding rats to sell as "rabbit" meat. He generates feelings of hatred or envy in others, but everyone wants to be close to him in order to experience the material rewards that he provides. He befriends an honorable British officer, Peter Marlowe, who acts as his interpreter and learns that many ethical dilemmas may be relative. One of the most fascinating aspects occurs after the end of the war, when many of the POWs are fearful to return to normal life. There are moments of excitement and drama, but mostly it is a testament to the strength and adaptability of the human spirit. The story will be most interesting to those who enjoy military, historical, and cultural topics. Не 5, ако имаше как и 10 звезди щях да ѝ дам... Разкошна книга. Не ми се искаше да свършва. От тези, които после ти оставят книжен махмурлук... просто стоиш, гледаш в точка, не можеш да излезеш от историята и да се върнеш към реалността. Очаквах труден за четене и може би малко черен роман, каквито са други любими образци на военната проза като "Обратният път" на Ремарк. Оказа се доста сериозна, но и адски четивна книга за приятелството, промяната, мъжествеността и още куп други теми. Клавел е интересен разказвач, на моменти образите се изкристализираха в ума ми подобно на кадри от филм, което вероятно има общо с историята му на сценарист. Определено ще прочета още нещо негово. Clavell's style here isn't exactly my cup of tea: so many run-on sentences, and I think Peter Marlowe is referred to as "Peter Marlowe" every single time in the narrative, which is very repetitious since he's the second main character. But I was able to put that aside because the plot kept moving and the characters really got under the skin. I also enjoyed the "extras" that the movie didn't show, such as the cross-dressing POW Sean who serves as the outlet for the prisoners' pent-up desires. 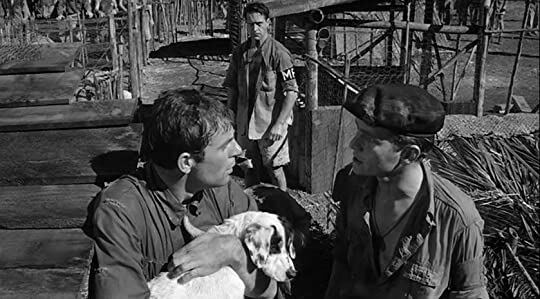 His character served to show the mens' vulnerabilities when in captivity, and their cruelties, once the camp is liberated and the world becomes "normal" again. When that happens, Sean isn't a tolerated lust object anymore, but a deviant freak. I loathed Grey in the movie (Tom Courtenay), but I warmed up to him more in the book. He's still a pompous asshat with a hugeass chip on his shoulder, but in the book version I saw him more as an officer from the lower classes who is trying to be more correct than the officers of privilege and title above him. He's jealous and petty and mean, but I honestly couldn't hate him. He's unable to not be outsmarted, and I have an affinity for underdogs anyway. And the glimpses into his personal life through flashbacks made him more sympathetic. That said, he's still a punctilious little prick and Courtenay delivered that in spades in the movie. The worst scene in the movie (for me, anyway, animal lover that I am) was here in the book and it was just as sad and morally uncomfortable. Anyone who has read or seen it knows what I'm talking about. It's a book packed full of grey nuance. Even the prison guards - a motley group of Chinese and Koreans under Japanese command - aren't all bad and join their captives in a cat-and-mouse black market game of survival. These 10,000 men, from across the entire Allied forces, are reduced to their basic instincts with a veneer of civil order. If a man steals, he might find himself stuck into a latrine borehole in the middle of the night to suffocate on the fumes and cockroaches, and have it ruled the suicide of a thief with a guilty conscience. But not all wrong doers get punished, as is illustrated with the matter of the false weight measures that Grey discovers. That corruption goes high up into untouchable territory, and there's little he can do about it except become complicit and loathe himself (and others) for it. I suppose the King is a figure of rugged, predatory individualism, traits that are praised in theory but become bad characteristics when the tables get turned and the prey feels empowered. The main question I had at the end of the book was: Did the camp need the King? Or does the King need the camp? One fed off the other, and when the environment is upended, the symbiotic relationship utterly falls apart. Somehow I feel that once the King goes back to the States, he'll become some kind of sad, pathetic huckster, having to constantly look for someone to fleece rather than having a captive, desperate source to feed off of. It's a rather sad justice that all of his cagey and morally ambiguous gains become utterly worthless once Hiroshima and Nagasaki got trounced and Japan surrendered. To stay on top, he needed that war to keep on going. a real good story teller. not easy to be a master. In King Rat, James Clavell succeeds in doing what countless other authors usually fail at: taken actual experiences from his life and distilled them into a gripping dramatic narrative. And this praise is perhaps the most damnable understatement the book can receive -- Clavell isn't writing about "experiences," he is writing about the cauldron from which he was "reborn" -- his time in Changi, a Japanese POW camp in Malaysia during WWII. 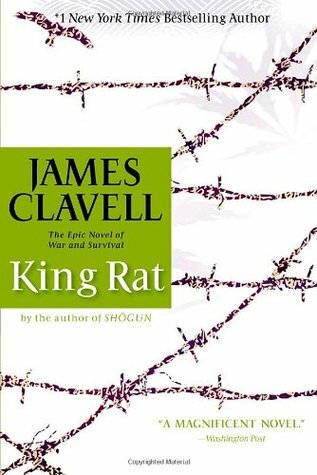 And yet, the book is mostly comedic -- filled with the hopefu In King Rat, James Clavell succeeds in doing what countless other authors usually fail at: taken actual experiences from his life and distilled them into a gripping dramatic narrative. And yet, the book is mostly comedic -- filled with the hopeful gallows humor of men who are living under the constant shadow of death. It's a story about survival and about friendship --- the true, unspoken kind that men shy away from when it is put into words. Perhaps the most impressive piece of trivia about this book is that it is Clavell's first novel (of which he would write only 5 more, each a masterpiece in its own right). This is the most intimate of his books (taking place entirely in one setting, and dealing with a fairly small cast of characters), and in many ways my favorite. A brutally realistic account of soldier's survival in a Japanese WWII prison camp. Clavell doing what he does best; making history come to life with very interesting and entertaining fiction. i just found out that King Rat is in part autobiographical. Clavell was apparently a POW himself. That explains are great deal. i was very much awed that a fictional book could be so incredibly detailed and convey the day to day struggle of the characters so well. JC was writing from experienc A brutally realistic account of soldier's survival in a Japanese WWII prison camp. This book was apparently written by Clavell in six weeks during a screenwriters strike in 1963. The story feels rushed and is messy at times with this sort of disconnected feel to it, but yet, I absolutely loved it. Maybe it's Clavell's urgency to tell the tale that gripped me. This book is not as macho as I thought it would be. There's actually a lot of tolerance and genuine emotion in all of the characters. I was moved by them and I wasn't expecting that. I've read Shogun and Taipan, and thoug This book was apparently written by Clavell in six weeks during a screenwriters strike in 1963. The story feels rushed and is messy at times with this sort of disconnected feel to it, but yet, I absolutely loved it. Maybe it's Clavell's urgency to tell the tale that gripped me. This book is not as macho as I thought it would be. There's actually a lot of tolerance and genuine emotion in all of the characters. I was moved by them and I wasn't expecting that. I've read Shogun and Taipan, and though I adored the story lines and over the top drama in those books, I never really connected with the main characters because they were so loud and bold like superheroes... But this book is different. Yes, the King is the embodiment of Capitalism and the "survival of the fittest" theory, but he's also really likable at times and you have to read the whole novel to get the allegory his story is meant to be. If you build your whole personality and worth using other people, what happens when those people turn their backs on you? What happens when the system that made you King collapses? When you're alone with your own thoughts, can you still be King? It's weird, I don't know how Clavell did it, because his language isn't extraordinary at all, and his characterization isn't the best out there, and his women always fall short, and his dialogue is sometimes off, but there's something about his writing and what chooses to say and not say that completely resounds with me. There's a silent beast lying under his words and I felt it there all the time. When I read the last few pages, as the POW were being taken away, each of them nursing their own private fears about returning to a home they didn't know anymore and probably wouldn't know them, I was deeply moved and those last pages were what makes this book great and not just good. In a strange way, I'm going to miss reading about bedbugs, heat, rice, fried eggs, rats, cockroaches, fences, boreholes, sweat, cards, Sarongs, diamonds, Kooa cigarettes, wireless radios, and of course, friendship. For those who survived those camps, they were never the same, and in this book Clavell shared a little piece of Changi with us. And I had to wonder, who would I be in Changi 1945? Or Steven, the gay male nurse who tended to every sick man in that camp regardless of their injury or rank? Or Sean, the beautiful actor who entertained the men at the expense of his own sanity? Or Peter Marlowe, the one who dipped into what he considered immoral out of the will to live. Dipped his hand in there until he almost lost an arm? Or maybe I'd be Grey, seething with jealousy, but unable to forfeit my high morality to sate my needs. Who knows. You never know how you'll behave once they strip you of everything and throw you into a cage. I wish every first novels had such ambition, scope and gusto. KING RAT is about the manliest, most violently existential novel south of Hemingway. It's full of dudes lost without the structure and the social status that normal life usually provides and completely adrift, not knowing the faith of the free world during WWII. KING RAT depicts the microcosm that was formed by all this doubt and confusion and follows the faith of men who used to live by the rules and the men who decided to create the I wish every first novels had such ambition, scope and gusto. KING RAT is about the manliest, most violently existential novel south of Hemingway. It's full of dudes lost without the structure and the social status that normal life usually provides and completely adrift, not knowing the faith of the free world during WWII. KING RAT depicts the microcosm that was formed by all this doubt and confusion and follows the faith of men who used to live by the rules and the men who decided to create their own. Clavell is better known for his later Shogun and other Japanese history novels, but this earlier novel about the lives of Americans and British POWs in a Japanese prisoner of war camp is a classic. The title character is an American with a true gift for survival in the underground economy of the camp, and the book raises many questions about what the most ethical road is to take in an impossible moral situation. The Asian Saga: survival in a Japanese pow camp. Zilele astea am făcut o incursiune prin podul casei, să mai scutur praful de pe cărți. De aici și până la a reciti a opta oară „Changi” de James Clavell n-a fost decât un pas. Ce carte de debut! Ce autor monumental! Mă înclin în fața ta, Clavell! Imaginați-vă un lagăr de concentrare situat pe o insuliță din sudul Asiei. În al doilea război mondial, între 1942 și 1945, acolo și-au făcut veacul mulți din prizonierii capturați de japonezi. Din 100 de mii, câți erau la început, la final au rămas doar 1 Zilele astea am făcut o incursiune prin podul casei, să mai scutur praful de pe cărți. Imaginați-vă un lagăr de concentrare situat pe o insuliță din sudul Asiei. În al doilea război mondial, între 1942 și 1945, acolo și-au făcut veacul mulți din prizonierii capturați de japonezi. Din 100 de mii, câți erau la început, la final au rămas doar 10 mii de schelete ambulante. Cartea ne descrie lupta lor zilnică pentru supraviețuire într-o lume în care nu doar gardienii erau dușmanii lor, ci și bolile tropicale, insectele, foamea și decăderea morală. Nu conta dacă erai australian, englez sau american. Gradele nu mai contau, făceau parte dintr-o lume trecută și demult uitată. Tot ceea ce conta era capacitatea de adaptare. Publicată sub titlul de KING RAT (adică Regele Șobolan), cartea e un adevărat manual pentru antreprenori. Cuprinde legi fundamentale legate de comerț, speculă și arta de a supraviețui, a deveni cel mai bun. Pentru că Changi nu este doar un lagăr ca toate lagărele, ci un loc unde viața se ia de la zero iar cel mai puternic și mai isteț urcă treaptă cu treaptă pe scara unei ierarhii nescrise. „Trebuie să ai grijă totdeauna de Numărul Unu!” este principiul de căpătâi al personajului King (tradus ca „Împăratul”), un caporal oarecare din armata SUA, devenit prin forțe proprii stăpân absolut peste lumea lagărului. Nu te apuca de afaceri înainte de a citi cu atenție această carte și... nu te apuca de scris cărți înainte de a citi această carte! The story takes place in an enclosed small wartime POW camp with imprisoned English, Australians, and some Americans. Japanese soldiers guard the camp which is surrounded by jungle and Malay villages. There is not much food, no medicine, incredible heat and biting insects. Soap is rare, privacy almost nonexistent. Men die every day from disease and despair. Clothes have rotted away and sarongs and rags are all that's available so rank is made known only by arm bands and a slight difference in li The story takes place in an enclosed small wartime POW camp with imprisoned English, Australians, and some Americans. Japanese soldiers guard the camp which is surrounded by jungle and Malay villages. There is not much food, no medicine, incredible heat and biting insects. Soap is rare, privacy almost nonexistent. Men die every day from disease and despair. Clothes have rotted away and sarongs and rags are all that's available so rank is made known only by arm bands and a slight difference in living huts. Rank and class are important to the British who try to maintain discipline but there is corruption and theft of food. The Americans are under the thumb of a superb entrepreneur who manages to have nice clothes, lots of food and Japanese money through great risk-taking in black market trading of food, soap and medicine. He is called the King and the other men are for forced to do his bidding such as light his cigarettes and tolerate his cooking of rare delicacies such as fried eggs while they starve, hoping for his table scraps in exchange for deals with labor, watches, lighters, and rings. The King works hard in getting the deal, forging unholy alliances with villagers, Japanese and Korean guards as well as the allied prisoners. People survive longer because of him if they have something to trade. Although he is only a corporal, he is really the king of the camp. However, almost everyone dislikes him to some degree. Staying alive is difficult for all including the King, but he has way more comforts than the others. While the King and his operations are in the center ring throughout this compact book, there are several sideshow plot arcs which illustrate the horror of an imprisoned society of men forced to compete for few resources. Attempts are made to conduct educational classes which quickly fail. They also try to have religious services regularly. Most of the men are morally compromised to some degree after almost four years as prisoners. Most are fearful of the future, not sure if wives and children survived or waited for them as letters are almost never sent or received through the Japanese. A Novel about prisoners of war in Asia that was wonderfully narrated. After finishing Clavell's Shogun earlier this month I immediately turned to Wikipedia to read more about the author. There I learned that he had been imprisoned by the Japanese during WW2, a POW in Changi Camp, and that he later wrote King Rat about a man he knew in that camp. I was fascinated by the idea of a semi-autobiographical story in this setting as I was convinced that the story would feel more authentic. And I was correct. Chang After finishing Clavell's Shogun earlier this month I immediately turned to Wikipedia to read more about the author. There I learned that he had been imprisoned by the Japanese during WW2, a POW in Changi Camp, and that he later wrote King Rat about a man he knew in that camp. I was fascinated by the idea of a semi-autobiographical story in this setting as I was convinced that the story would feel more authentic. And I was correct. It feels as though the book will be a magical and lovely tribute of sorts to an equally magical and lovely place. I found the deep irony of that to be a fantastic way to introduce a novel of war. Clavell's writing is very good. He takes you on a journey into the POW camp where you find yourself wasting away from lack of food, and willing to do almost anything to stay alive. The story is gripping and shocking. We find ourselves living among men living in the most extreme circumstances, and we see exactly how that can cause some people to act. The two main characters of the novel are very different from one another and yet it is believable that they forge a friendship. The man called the King is a clever, smart, young American who takes advantage of everyone. He is not likable, and operates in such a way as to inspire both fear and revulsion but also some measure of admiration. The second man is a British officer named Peter Marlowe who has always thought that the upper classes of civilian and military societies were better people than the lower classes. When Marlowe comes into contact with King and finds himself needing King's skills his views begin to change. This is where the book sings, in my opinion. The men are courageous, brave, and have the greatest survival instincts. But they also show a lack of scruples. They are flexible which allows them to adjust to one another. What can a person do to survive the worst? What will he have to change about himself? How will he adjust when the war ends? Will he take away anything positive from the experience? Will the people he love before remain in his heart and he in theirs? This book provokes thought about all of these things and now I wish I could find a biography of the author with more insight. Клавел наистина има добри попадения изледвайки живота в един лагер на военнопленници по време на втората световна война. Жаждата за живот и омразата към високопоставените изяжда душите на всички. Благодарение на приспособилият се към живота в лагера Цар и сечащият му като бръснач ум преживяват и всички останали. Но те са твърде заслепени от завистта си, за да оценят факта, че дължат преживяването си на Царя. С черна търговия и хитрост той винаги съумява да е на ръба между охолният си живот в лаг Клавел наистина има добри попадения изледвайки живота в един лагер на военнопленници по време на втората световна война. Жаждата за живот и омразата към високопоставените изяжда душите на всички. Благодарение на приспособилият се към живота в лагера Цар и сечащият му като бръснач ум преживяват и всички останали. Но те са твърде заслепени от завистта си, за да оценят факта, че дължат преживяването си на Царя. С черна търговия и хитрост той винаги съумява да е на ръба между охолният си живот в лагера и ужасният пагубен затвор Утър Роуд. Мръсни сделки и нечестиви души вършеят и оцеляват благодарение на забравените добродетели и животинските си инстинкти. Животът в лагера Чанги погубва всеки срам и приличие у човека. Разболява здравият разум, но не и състраданието дори към врага. Изключително много ми хареса края, сравнението на Царя с плъха Адам и изключително краткото, но точно и ясно сравнение на съдбата на плъховете с живота в лагера, а и не само-но и с живота такъв какъвто го познаваме всички ние. Отрезвяващо! Има четива, в които просто се загубваш, ти си в тях, героите стоят до теб и ти сякаш си част от всичко наоколо. Аз се загубих в това четиво, искрено исках да прегърна Питър когато разбра за ръката си, когато полудя пред приятелите си и когато се влачеше полумъртъв към оградата за парите. Изпитах истински жал когато онзи млад мъж трябваше да се раздели с кучето. Ужасно отвращение към огощението на Царя за рожденият му ден. Шон, моя загубена душа- не трябваше да се погубваш по този начин! At one time or another I've read most or all of James Clavell's novels. KING RAT is by far my favorite. I've lost count of the number of times I've read this novel. I also own the movie version of the story on DVD; and yes, I've lost count of the number of times I've watched the movie. I like the book better. Clavell survived as a POW in WWII. 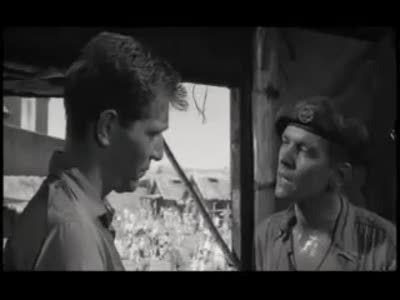 The sub-story is that the Peter Marlowe character in KING RAT is a fictionalized version of James Clavell and that the Corporal King character is a fictionalized version of the buddy in the Japanese camp who actually saved Clavell's life. I think all of Clavell's novels made it to either TV or Movie form; in some cases he wrote the screenplays, in most, not (he was too busy doing other more important things in Hollywood, or writing his next blockbuster novel). 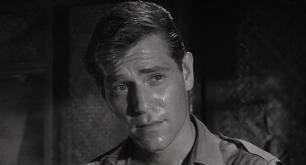 His career in Hollywood is almost as impressive as his novels (Due to lessons he learned the hard way in the POW camp? Correction: Due to lessons he learned the hard way in the POW camp!). Did you know that Clavell wrote the movie THE FLY? Did you know that Clavell co-wrote the movie THE GREAT ESCAPE? Did you know that Clavell wrote and directed the movie TO SIR, WITH LOVE? I won't sport with your intelligence by relating the plot of the famous KING RAT story as told in novel and movie beyond to say that it is the story of how an American prisoner in a Japanese internment camp became more powerful than the Japanese warden. For those fond of "How To" books like How To Succeed In Business, or How To Win At War, I wouldn't mess with SUN TZU or the latest rewording of Machiavelli. Go to KING RAT. As an Author myself I trace my roots on why I wanted to write back to "King Rat." After "Shogun" this is probably my favorite Clavell story, and rightfully so, as this was written based on Clavell's own experiences in a POW camp in WW II. What I take most from this book is that it directly inspired me to pursue writing, not for writing's sake, but to leave something worthwhile behind to inspire future generations. Was googling Japanese POW camps to find more info after reading this amazing story. It's not for the faint of heart but very well done and worth your time. Just very eye opening to the deplorable conditions that prisoners lived in in that era. My grandparents lived in China during the bombing of Hiroshima and Nagasaki and I remember them talking of a Japanese woman surviver that lived near them and took care of their children. Very good book!!! Set in 1945 in Changi prison towards the end of the war, a story of men imprisoned on poor rations for months and years, and the growing relationship between a young British RAF officer and an American corporal, King. King is the best and cleverest black marketeer and operator in Changi. The desperation of all the camp inhabitants is all the more real when you know the author was in Changi himself for 4 years - this was his first novel, published in 1962. "Животът на мъжа е вечен кръстопът. Но истинският мъж не избира само своята посока. На плещите му винаги лежи съдбата и на други хора." At last, the final book on my 1962 reading list. I read this a long time ago before I was keeping my reading log, so sometime in the 1980s. It was my first experience with what I now call Prison Camp Lit. The dirt, the starving, the dysentery, etc. Ugh. I remember it as a shorter book. The reprint I got from my local library contains sections left out of the original publication in 1962, giving a look at some of the wives and girlfriends of the prisoners and what they were going through while th At last, the final book on my 1962 reading list. I read this a long time ago before I was keeping my reading log, so sometime in the 1980s. It was my first experience with what I now call Prison Camp Lit. The dirt, the starving, the dysentery, etc. Ugh. I remember it as a shorter book. The reprint I got from my local library contains sections left out of the original publication in 1962, giving a look at some of the wives and girlfriends of the prisoners and what they were going through while their men were in the camp. Some people on Goodreads (mostly men) didn't like having those parts added; they felt it broke the spell. I say, it was some much needed relief. In any case, I am glad I reread it. I had no idea about such things in the 1980s. My, how innocent I was. Imagine writing regularly to someone you loved, not knowing if he was even still alive, not knowing if he got your letters. I hadn't remembered much except for the King and the rat farm. I hadn't known that the book was based on Clavell's experience in such a camp in WWII and that Peter Marlowe was based on himself. This review has been hidden because it contains spoilers. To view it, click here. 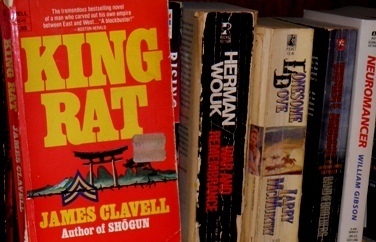 I first read "King Rat" as a young teen as part of Clavell reading binge that followed the initial broadcast of his mini-series, Shogun. Living in Singapore and touring WWII historical sites here reminded me of Clavell's semi-autobiographical novel of the dehumanization of POW's in Changi Prison during the war. I recommended this novel to my teen son and then re-read it myself. King Rat still details the psychological abuse and breakdown of ordinary men in sub-human conditions better than any ot I first read "King Rat" as a young teen as part of Clavell reading binge that followed the initial broadcast of his mini-series, Shogun. Living in Singapore and touring WWII historical sites here reminded me of Clavell's semi-autobiographical novel of the dehumanization of POW's in Changi Prison during the war. I recommended this novel to my teen son and then re-read it myself. King Rat still details the psychological abuse and breakdown of ordinary men in sub-human conditions better than any other account I've since read. The survivors are left to deal with survival instincts that may not fit them for life in the "world".